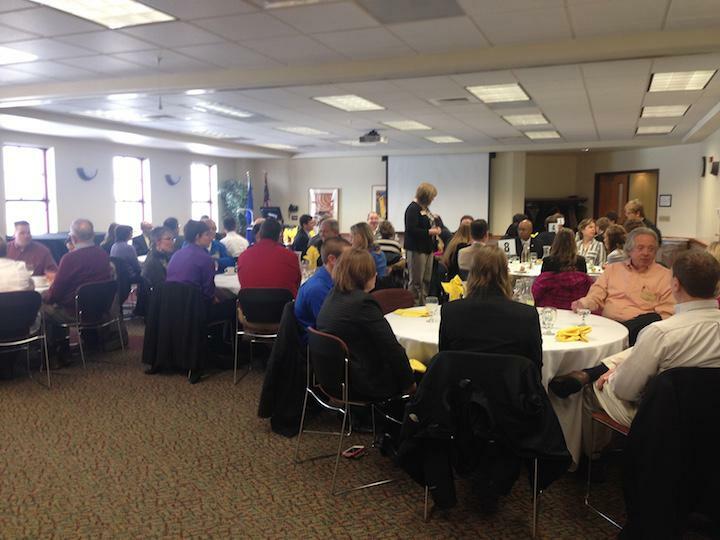 Prospective students speak with successful Lakeland alumni and faculty over lunch. Lakeland’s 2016 Business Colloquium took place on Tuesday, March 1, bringing four Lakeland alumni who have been successful in business back to their roots. 1992 graduate David Antonini, 2007 graduate Barkha Limbu Daily, 2000 graduate Samantha (Marr) Tonn and 1990 graduate Andrew Viglietti took part in two panel discussions at the Wehr Center: One for prospective students and their parents and another for current Lakeland students. The latter was required attendance for students in many business and economics classes. The four alumni answered questions from the event’s host, Emeritus Professor of Business Administration J. Garland Schilcutt, who has served Lakeland for more than five decades. The alumni spoke of how Lakeland in general prepared them for their business endeavors. Tonn, the vice president of quality, risk and corporate compliance for Prevea Health, focused on the opportunities Lakeland provided her for experience, such as organization leadership. Despite all of the praise for Lakeland, the alumni were sure to warn students that being successful takes more than going to a certain school. Daily, co-owner of award-winning Thiensville restaurant The Cheel, was straight with students about how they need to take action for themselves. On the other hand, Viglietti, now the administrator of the Sharon S. Richardson Community Hospice, gave comforting advice to young students who are unsure of their future. After the final panel, the alumni attended a special lunch at the Laun Center at which prospective students and their accompanying family members were served sandwiches and pasta as they discussed their hopes for college with longtime faculty members and the successful graduates. Following the meal, the alumni engaged in further discussion with current students. Each speaker took on their own classroom for an hour of guidance.